TheBay County Gypsy Moth Suppression Program (Program) is mandated to monitor forand suppress Gypsy Moths and other non-native pests that affect trees and plants in Bay County. In an effort to protect trees from feeding GypsyMoth caterpillars, treatment has been scheduled for three (3) areas of Bay County where Gypsy Moth populations have reached outbreak levels. Treatment will be done between 6:30 a.m. and 12:00 p.m. (Noon) one day between May 22nd and June1st. Timing of treatment is dependent on the development of the feeding Gypsy Moth caterpillars, development of the tree leaves, and the weather. Once the date for treatment is set, specific weather parameters need to be present for spraying to occur. These parameters are light winds (3-10 miles per hour), relative humidity above 50%, and less than 40% chance of rain predicted for the next four to six hours. If weather conditions are outside these parameters, spraying will be postponed until the next day or when conditions improve. The biological insecticide Foray 48B will be used for this treatment. Foray,a water-based insecticide formulation, is OMRI certified organic so it can beused on organic foods. The active ingredient is Bacillus thuringiensis variety Kurstaki (Btk). Research has shown that Btk will only kill thecaterpillars of moths and butterflies that are feeding at the time of application. It is not known to affect humans, pets, birds, fish or other insects. The Al’s Aerial Spraying,LLC of Ovid Michigan will treat using a bright yellow airplane that will fly low over the tops of the trees. Treatment to protect ash trees from the invasive Emerald Ash Borer (EAB) will be done in Spring 2019. Oaks trees are some of our favorite trees and are also favorites of gypsy moths. Gypsy moth populations across Bay County remain low so they should not cause problems for the oak trees this summer. Unfortunately a deadly fungus disease called oak wilt is now becoming active along with the tiny picnic beetles that carry the disease from one tree to another. They are attracted to wounds on trees so stop pruning your oak tree now until next fall. For more information on oak wilt click HERE. The beautiful flower of flowering rush (Butomus umbellatus) may look lovely, but is invasive in Michigan. Flowering rush is an aquatic invasive plant that lives along the edges of lakes, streams and wetlands. It is a perennial plant that grows to a height of 3-5 feet. The pink flower that blooms in June makes it easy to identify at that time. This plant is spreading throughout the Saginaw Bay watershed with the majority of sightings along the Shiawassee and Saginaw Rivers. It is important for invasive species managers and the public to help map the extent of flowering rush through MISIN. Knowing the extent of flowering rush will allow managers and organizations to prepare efficient management plans. For more information please click HERE. As you're enjoying the summer trees in full bloom around Bay County know that the staff of the Gypsy Moth Suppression Program have been working hard to save the public trees throughout our community. To protect our trees and horticulture form non-native invasive species that threaten to upset the natural balance in our area. One such non-native invasive species is the Emerald Ash Borer (EAB) which arrived in Bay County around 2007. Since the EAB treatment program began five years ago, staff has been able to save and maintain over 3,400 ash trees on public lands. These trees provide not only shade to the areas where they stand but many ecological and economic benefits. They reduce heat in the city saving on summer air conditioning costs; reduce winds in the winter saving on heating costs; produce oxygen, remove carbon dioxide and other pollutants from the air improving our air quality and reduce storm water run-off. The Gypsy Moth Suppression Program staff have begun measuring and evaluation ash trees in Bay County to determine which trees are likely to survive an EAB attack in order to determine which trees have the best success rate for treatment. Look for these signs and symptoms on your ash trees as they may be signs of an EAB Infestation: Thinning of upper canopy of the tree; Water Sprouts on trunk and Branches; Cracks in the bark; S-shaped tunnels under the cracks; Wood pecker damage; D-Shaped holes in the Bark. If you suspect that you have Emerald Ash Borer (EAB) infesting your ash trees, please contact Alicia Wallace, Program Coordination of the Bay County Gypsy Moth Suppression Program at 989-895-4195 or wallacea@baycounty.net for more information about what you can do. Check out the United States Department of Agriculture (USDA) Animal and Plan Health Inspection Service website Hungry Pests for more information on various invasive pests and what you can do to prevent their infestation. The Bay County Gypsy Moth Suppression Program was established in 1989 to control outbreak levels of the invasive species Gypsy Moth (Lymantria dispar) occurring in Bay County. Heavy infestations of the Gypsy Moth can cause area wide damage to trees, woodlots and adjacent property when the feeding caterpillar life stage eats the leaves off of area trees (defoliation). The favored tree types targeted by Gypsy Moths are oak, polar, birch, willow, apple, and even spruce and pine. These are the dominant trees types in our landscape and woodlots. Defoliation makes the trees susceptible to disease and even death. The Gypsy Moth program serves to protect trees in Bay County from defoliation and damage from Gypsy Moth caterpillars by educating the public on prevention and control methods, and conducting surveillance monitoring in wooded areas to evaluate the prevalence and density of Gypsy Moth at its various life stages. When monitoring shows populations are at significant outbreak levels, treatment is provided to reduce the population and control the infestation. Monitoring all wooded and residential areas of Bay County for the presence of Gypsy Moth life stages. Conduct suppression/control activities in heavily infested areas of the county. This includes determining where out-break level populations occur, contracting with an aerial applicator and conducting treatment projects in highly infested areas, and evaluation of treatment results. Cooperate with the Michigan Department of Agriculture's (MDA) grant program for Gypsy Moth suppression to ensure maximum reimbursement on treatment and administrative costs. By following MDA guidelines and participating in the grant program, Bay County is able to reduce the cost of the program for Bay County taxpayers. Conduct educational programs for schools, property owners, and local civic groups. The program utilizes Bay County Pinconning Park as a staging area for many of these presentations, which include information on the life cycle of the gypsy moth, how it fits into our local ecology, and methods for controlling the gypsy moth. The Emerald Ash Borer (EAB) is an Asian beetle that moved into the south-east corner of Michigan some time in the early 1990's. It's larvae feed on the cambium or conductive tissue just under the bark of ash trees. The emerald ash borer(EAB) is a very destructive insect that kill all species of North American ash trees. It is responsible for the death of millions of trees throughout Michigan and it has spread to 13 additional states and 2 Canadian Provinces. First found in the Detroit area of south eastern Michigan in 2002, the EAB were most likely introduced into the USA in wood packing material during the early 1990's. The Bay County Gypsy Moth Suppression Program responded to threat to our local forests by adding the EAB education and monitoring to Gypsy Moth Program Activities. Many insects and related arthropods perform functions that are directly or indirectly beneficial to humans. They pollinate plants, contribute to the decay of organic matter and the cycling of soil nutrients, and attack other insects and mites that are considered to be pests. There is no difference. Both are lady bugs but the Asian variety has the habit of moving indoors for the winter in large numbers. This is to make finding a mate easier in the spring. Besides the Gypsy Moth and the Emerald Ash Borer (EAB), there are many insects and plants that can invade our yards and woodlands. Please check out our information regarding Other Invasive Pests & Plants. Pesky red squirrels will feed on spruce buds when other foods become scarce in the winter. 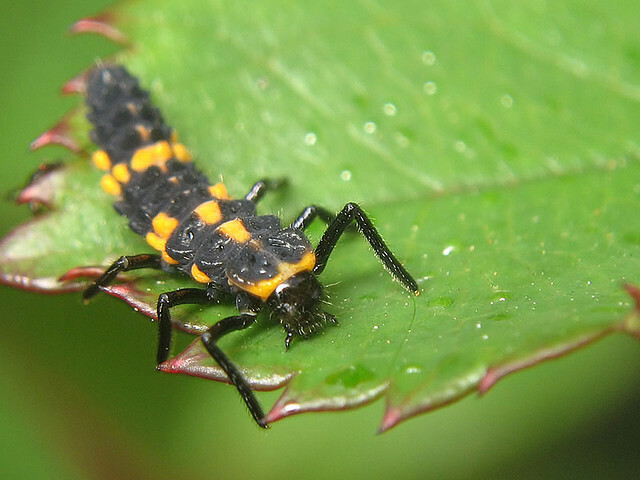 Identifying these pesky, winter, landscape pests by the location of the damage they cause. Even though the weather is getting colder, there are still many tasks to do in your garden before winter settles into the area. This article can explain what you should be doing now to ensure you have a healthy garden next spring. Bay County Gypsy Moth Suppression Program staff members are available to visit your home or site to check for invasive pests such as gypsy moths, emerald ash borers and other native or non-native invasive pests that may be affecting the health of your trees and shrubs. Please call 989-895-4195 if you have any questions.